Building « Global Market Insights, Inc. The competitive matrix of self-compacting concrete market is all inclusive of top notch companies that have been heavily investing in strong alliances to come up with innovative solutions that are not only efficient but also environmentally viable. For instance, Tarmac, one of the most acclaimed U.K. based sustainable material group, recently acquired the remaining 50% share of Scottish Power, under the long-standing ScotAsh joint venture. Reportedly, through the deal, the self-compacting concrete market giant would get full proprietorship of ScotAsh. Experts claim this agreement to be highly strategic from Tarmac’s end, given its long term plan of widening its customer base with cutting-edge products, tapping the superfluity of expertise from both the organizations. The pipeline of such innovative projects on-board has undoubtedly sent out waves of expectations in self-compacting concrete industry. Self-consolidating concrete has lately become an indispensable component in modern construction activities, pertaining to some of its exceptional beneficiary features such as high segregation resistance and flowability. It is therefore quite indisputable that the growth in construction domain will leave a perpetual impact on self-compacting concrete market trends. As per estimates, the overall construction spending is forecast to cross USD 13 trillion by 2023, almost double than what is recorded in 2015 (USD 7 trillion). The humungous figure, itself is enough to draw a picture of the growth opportunity of self-compacting concrete industry over the forthcoming period. With increasing deployment of self-compacting concrete in constructional activities, the necessity of R&D investments to exploit the material’s fullest potential has become even more crucial. In fact, market giants have been showcasing a great deal of interest in diversifying their product portfolio in sync with the sustainability trends. For instance, an absolutely fresh of the boat concept, dubbed as Eco-friendly self-compacting concrete or Eco-SCC has been introduced in APAC and Europe self-compacting concrete market that is claimed to possess lower cement content. Allegedly, the product is already gaining a mass popularity across the construction domain, pertaining to the fact that Eco-SCC is manufactured by aggregate gradation. In parallel to this, a plethora of driving factors including spreading awareness about sustainable buildings, green certification, and governmental standardization, collectively depicts that Eco-SCC, in all likeliness, would prove to be the next disruptive trend in self-compacting concrete industry space. Asia Pacific is slated to be one of the most lucrative avenues for self-compacting concrete industry growth, given the strong pipeline of constructional projects across major countries like China. Statistics depict, with China at the forefront, APAC belt is forecast to account for almost 60% of the overall construction expenditure by 2025. Furthermore, Asia Pacific self-compacting concrete market is governed by a stringent regulatory frame of reference enforced by authorized bodies that have implemented favorable policies under the structural reform plan. 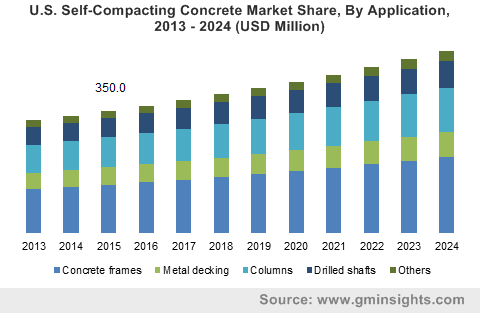 Pertaining to the massive industrialization and urbanization across the continent, APAC self-compacting concrete market pegged a valuation of USD 14 billion in 2016 and is likely to record a decent growth pace over 2017-2024. High raw materials price trends compared to its conventional counterparts along with limited utilization of the product in the infrastructural domain are claimed to be the two major constraints deterring self-compacting concrete market penetration across some of the geographies. Nonetheless, renowned biggies are set to explore various opportunities and challenges of the business fraternity in the ensuing years by investing in advanced technologies that not only ensures improved functionality but also competitive pricing. Driven by the considerable developments on the product front in tandem with expansive application landscape, the self-compacting concrete industry is forecast to exceed a valuation of USD 30 billion by 2024. This entry was posted in HVAC and Construction and tagged Admixture, Building, Cement, Columns, Combination, Concrete frames, Construction, Design Mix, Drilled shafts, Fibers, Fine & Coarse Aggregates, Infrastructure, Metal decking, Oil & Gas, Powder, Raw Material, Self-Compacting Concrete Market, Self-Compacting Concrete Market Research, Self-Compacting Concrete Market Share, Self-Compacting Concrete Market Size, Viscosity Agent, Water.